Perhaps it’s a rite of passage when visiting an artist in their own home that you’re welcomed warmly and fed delicious cake. as any artist worth their weight is. Her house plays homage to artwork – her own, that of favourite artists, and plenty by her grandchildren. It’s all immediately comforting, as is Holly. She has a beautiful smile. Holly’s collection of animals have all introduced themselves. From a pug, to chickens to a newly adopted duckling. “She thinks she is a chicken. I’m going to have to get her a mirror so she can get to know herself better,” she says of the latter. Holly’s cake is very, very good. Describing herself as a “natural twiddler”, Holly has relocated to New Brighton where she has continued her work as a secondary school teacher, after spending her life living in Avonside. She found herself displaced after the quakes when her house, along with many others in the area, was deemed irreparable. Tiny Offerings came about as a response to this – where as a woman, Holly felt like she was overworked, under-appreciated, and just wanted “a bloody good cup of tea”. Holly mentions the trauma of losing precious heirlooms passed down from her grandmother, to her mother and how she regrets not salvaging pieces of patterns, or keepsakes that she could repurpose at a later date. “Many of these objects held deep memories, and had been witness to much of my growing up. Then suddenly they were broken and swept away. I started to realise it wasn’t just the beauty of my teacup and saucer, it was all the memories it held that I was missing. They weren’t quite right, or didn’t hold the same gravitas as her lost pieces. She shows me a piece she’s recently worked on – a mix of byzantine golds and whimsical patterns. This particular piece shows a woman searching for her cup of tea with binoculars. The cup of tea is on the opposite side of the piece. It’s all very light-hearted, but also meaningful. Out in the garage among the kiln and works in progress, Holly introduces me to a range of ceramic penguins her students have worked on as a fundraising project and part of the school curriculum. They have come home with Holly to be fired. Sometimes there’s a few that come out missing wings or beaks, and as a result, Holly’s partner Chris has a collection of these oddities. 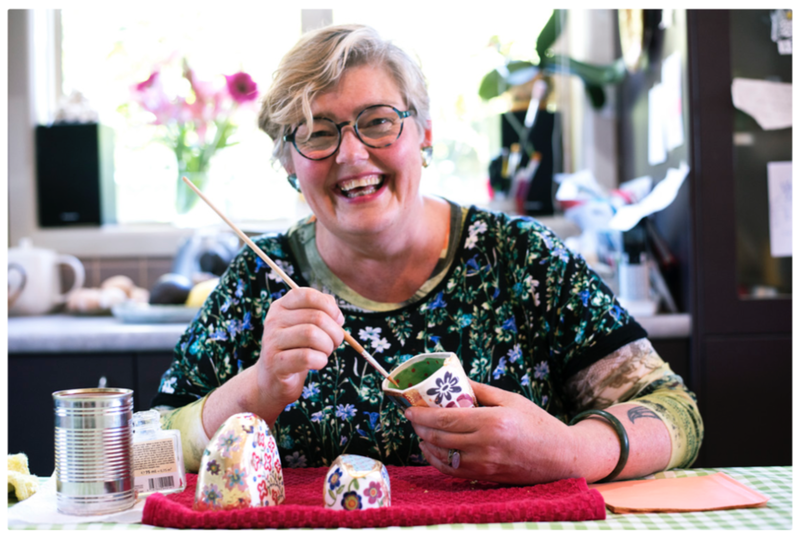 Holly casts her Tiny Offerings at home, in porcelain slip, hand paints them with underglaze before firing, then gilds each piece with 22 carat gold. The finished product is designed to change slightly over time, developing a deeper patina. Touching is encouraged. Holly calls them “meditation pieces”. “I want people to hold and turn and look at them, have conversations with them there as a witness, maybe pass them down to someone else to care for and enjoy. They might help someone capture a tiny space in time and thought. They are a quiet witness to moments in someone’s life.